It’s no secret that Joe Maddon likes to rotate his players. Outside of Anthony Rizzo and Kris Bryant, no Cubs player reached two-thirds of the team’s games at one position, with only Jason Heyward (right field) and Kyle Schwarber (left) even topping 100. That philosophy extends to Maddon’s usage of his bench, from which many of those rested players are summoned during a game to further shuffle that defensive alignment or play matchups at the plate. This isn’t a false narrative based on Maddon’s reputation for tinkering: the Cubs ranked second in plate appearances from substitutes in 2017, behind only the Dodgers, the league’s most brazen roster manipulators through their usage of the 10-day DL. What does this have to do with Albert Almora Jr.? 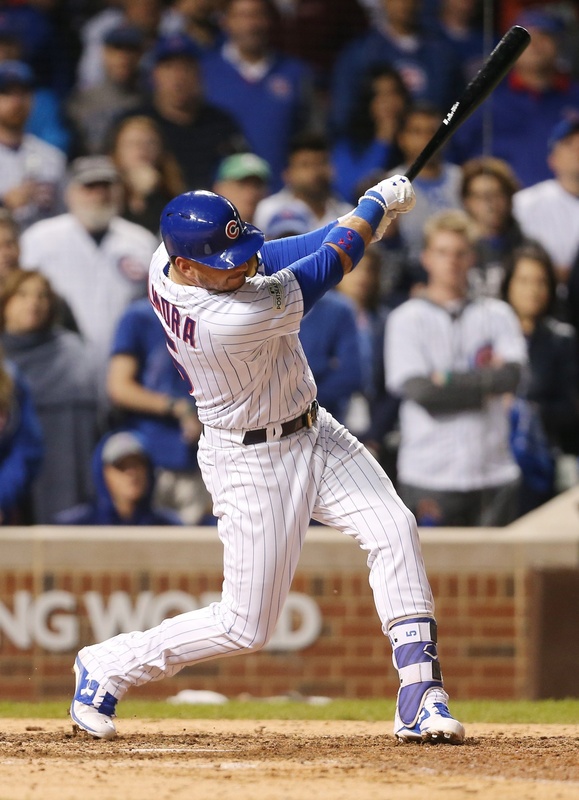 The 23-year-old led the Cubs with 72 plate appearances off the bench, entering 67 games in total as a substitute. Almora didn’t bat in nine of those games; in the other 58 he hit an outstanding .380/.375/.620. It wasn’t the gaudy slash line that stood out on Almora’s player page, however. The .407 BABIP certainly suggests that there was at least some good fortune involved in that. It was the fact that he struck out 10 times and walked none, as one might have guessed from that OBP (there was a single sacrifice fly). This was extremely different from Almora’s numbers when his name was in the starting lineup: he walked 19 times to 43 strikeouts over 251 plate appearances. This is fundamentally a very small sample size, yet the disparity in plate discipline suggests that Almora is actually taking a different approach when he comes off the bench. In order to compare Almora’s approaches as starter and sub, I used the Event Finder on the Baseball-Reference Play Index and Almora’s game log to create a list of all plate appearances, categorised by whether they were as a starter or sub. Almora is one of the league’s most aggressive batters by pitches per plate appearance. 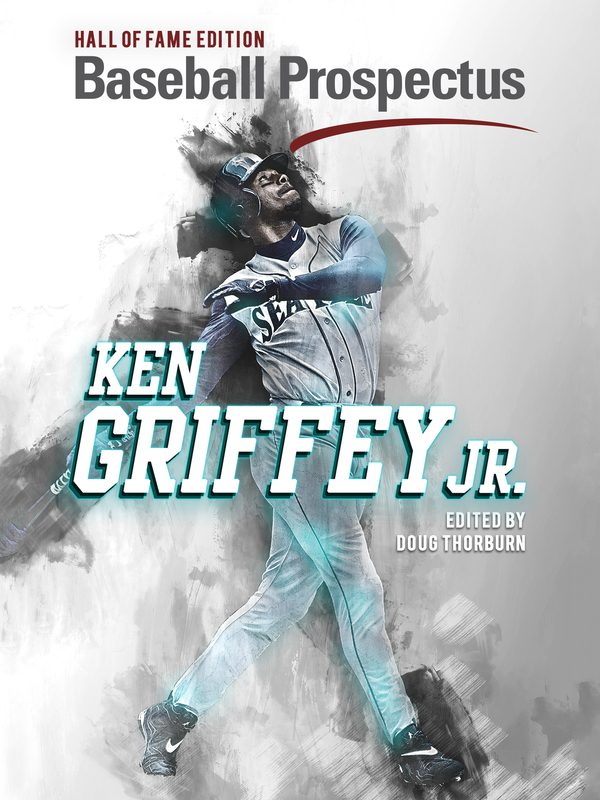 Although he didn’t accumulate enough plate appearances to qualify for the batting title, he would have ranked third in the league for fewest pitches per PA with 3.46, behind only Yulieski Gurriel and Dee Gordon. Nonetheless, when it comes to the starter-sub split, the difference is still huge: Almora saw 3.54 pitches per PA as a starter, and just 3.16 as a sub. Almora also had at-bats that lasted just one pitch almost 20 percent of the time when coming off the bench, as opposed to 16.3 percent as a starter. 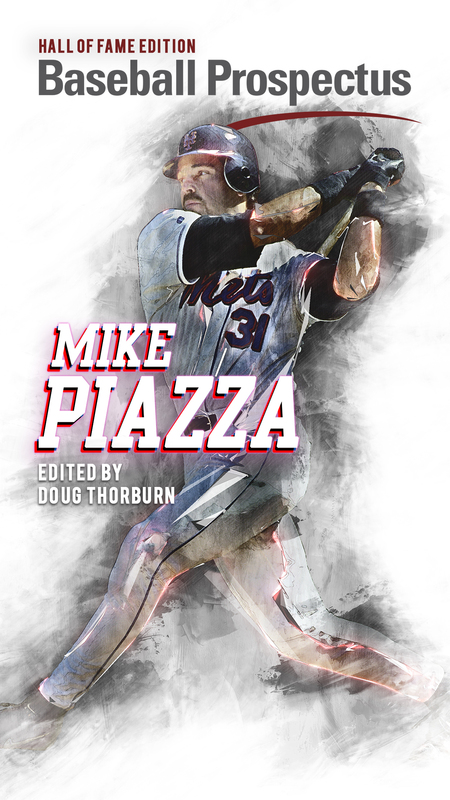 81.9 percent of the young outfielder’s plate appearances off the bench were concluded in four pitches or less, 13 percentage points higher than his rate as a starter. It’s no surprise that Almora didn’t take a walk when coming off the bench: he only got into a single three-ball count in those 72 PA, and it was a 3-2 count (he struck out looking to Zach Duke). In contrast, Almora saw 38 three-ball counts as a starter, walking in half of them. Almora did swing at more pitches as a sub, both missing and also putting the ball in play more often than he did as a starter, as might be expected from his slash line. None of this quite points towards a zero-walk player, though. If Almora was truly becoming more aggressive when coming off the bench, that should also manifest itself in swinging early in the count, which wouldn’t necessarily be evident in the above table. The below graph instead breaks down simply the frequency at which Almora swung, by each of the first six pitches of the at-bat. Almora was ever so slightly more inclined to swing at the first two pitches of the at-bat when coming off the bench. The difference is negligible when compared to pitches three and four, where the difference is clearly massive. This might suggest that the 23-year-old ended up in a ton of pitcher-friendly counts early on as a sub, forcing him to swing more often. On the third pitch of an at-bat, Almora’s rates were actually almost identical: he fell behind 0-2 35.4 percent of the time as a sub, as opposed to 34.9 percent as a starter. When he made it to the fourth PA, the difference is much clearer: Almora was in pitcher’s counts of 1-2 and 0-2 in a massive 80.8 percent of PA, contrasting with just 54 percent when he was in the starting lineup. That’s a significantly reduced sample because many of those fourth pitches never came. Almora put the ball in play very often on the third pitch, with over 45 percent hit into play, 20 percentage points higher than his starter rate. The most pertinent question might be whether there is anything wrong with Almora’s approach. If he was going out and just swinging at everything regardless of location, that would suggest a change needed to be made. The Baseball Savant data also includes location for every pitch, both in a raw x-y coordinate basis and split by Gameday zones. To keep things simple, I’ve used the latter to categorize whether the pitch was in the zone (zones 1-9) or outside (11-14), and then split that data by whether Almora swung at it or not. 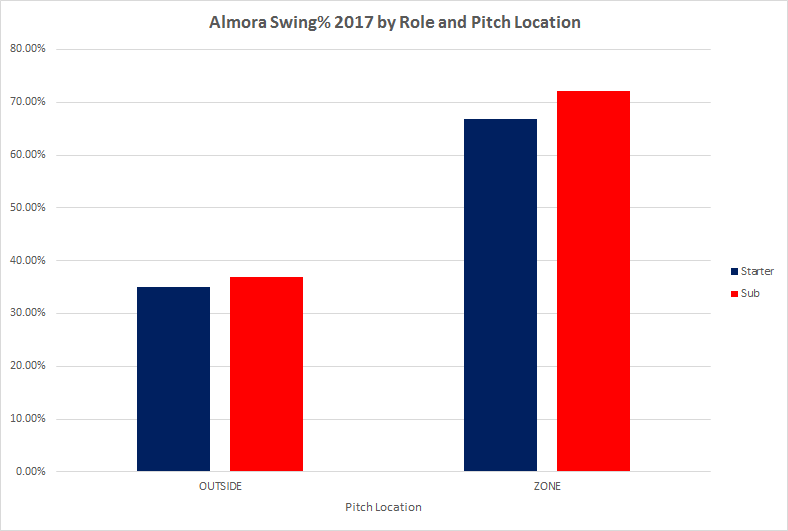 In both cases, Almora swung at pitches more often as a sub, yet the difference is far more pronounced on those pitches in the zone. He swung at those 72.2 percent of the time, an increase of over 5 points. 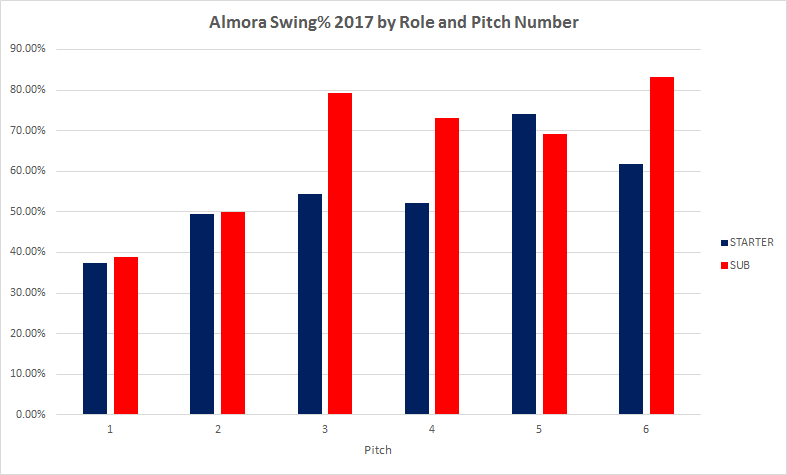 This suggests that, if anything, Almora is making better decisions about which pitches to swing at as a replacement than he is when he starts the game. That could be partly attributed to receiving information from his teammates about the pitcher on the mound, or the umpire’s zone that day. There’s even some data to suggest that Almora would be better off being more aggressive early in the count when he is brought off the bench. In the first two pitches of at-bats as a sub, he saw 11 in zone 5, the very middle of the zone. He swung at only five of those, as compared to 28 of 43 as a starter, a 65.1 percent swing rate. The 23-year-old might actually be too passive early on in the count, as hard as that is to believe given his swing data overall. Fundamentally, these samples are all very small, and there are a lot of complicating factors which can skew such a sample: the game situation, the quality and type of pitcher, and the intricacies of the individual plate appearances, to name a few. Nonetheless, if we look past the noise and focus in on the approach, it’s possible Almora the sub might just have something to teach Almora the starter.